Dates of birth and death unknown. 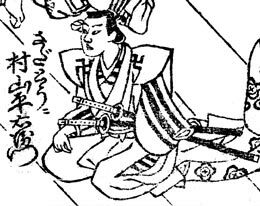 Great-grandson of Murayama Matazaemon I (actor), grandson of Murayama Matazaemon II (actor) and son of Murayama Matatarô (actor/manager), he was the 4th generation of an important family of Kabuki actors and theater managers, which was active in Kyôto. His name for most of his career was Murayama Matabê and he took the name of Murayama Heiemon I in his latter years. He was active from the beginning of the 1650s to the beginning of the 1670s. He was the father of Murayama Shichiroemon and Hayagumo Chôdayû I. Dates of birth and death unknown. Son of Murayama Heiemon I, he was, like his father, an actor and a Kabuki theater manager in Kyôto. His first name was Murayama Matakichi and he took the name of Murayama Heiemon II after the death of his father (during the 1680s). He gave his name to his adopted son Murayama Kuroemon and took the name of Murayama Shichiroemon in 1692. The actor Murayama Heiemon III held this name from 1692 to the 6th lunar month of 1718.